I am a sucker for citrus; I love the bright, tart and sweet flavor of lemon desserts and this one is a keeper. 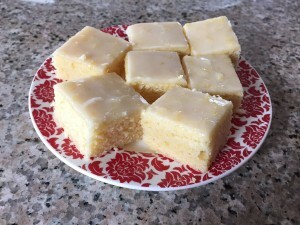 I got the recipe from melskitchencafe.com, but she calls them lemon brownies, which is misleading – there is no chocolate involved. The recipe bucks convention (the butter is melted and the sugar is treated as a dry ingredient) so I was worried that it would not work, but they turned out fine. The lemon is the star, and they cut nicely in to pretty squares. They would be perfect for a shower of afternoon tea party. I may try this again, using a traditional method of creaming the butter with the sugar. The glaze recipe makes a very thin, light layer of sweet, lemony glaze on top of the soft, chewy lemony brownies. If you want more glaze, consider doubling the recipe (just make sure the glaze doesn't overpower!). Altogether, you probably need 2-3 large lemons for the recipe to get the 4 tablespoons juice and 1 tablespoon (plus 1/2 teaspoon) zest. These bars are delicious at room temperature but try them chilled and you may never go back.